The new Callaway XJ Junior Golf Sets are suitable for boys or girls, and been specifically designed to offer junior golfers the best equipment for their height range. There are two size options available: XJ2 and XJ3. The XJ3 are suitable for a height range of 54-61". The sets also come in two colour choices: Blue or White. The XJ clubs feature Callaway's industry leading Technology designed for distance and forgiveness. The sets include Titanium drivers and graphite shafts. The Junior XJ clubs are also ultra-lightweight making the club easier to swing for better performance. 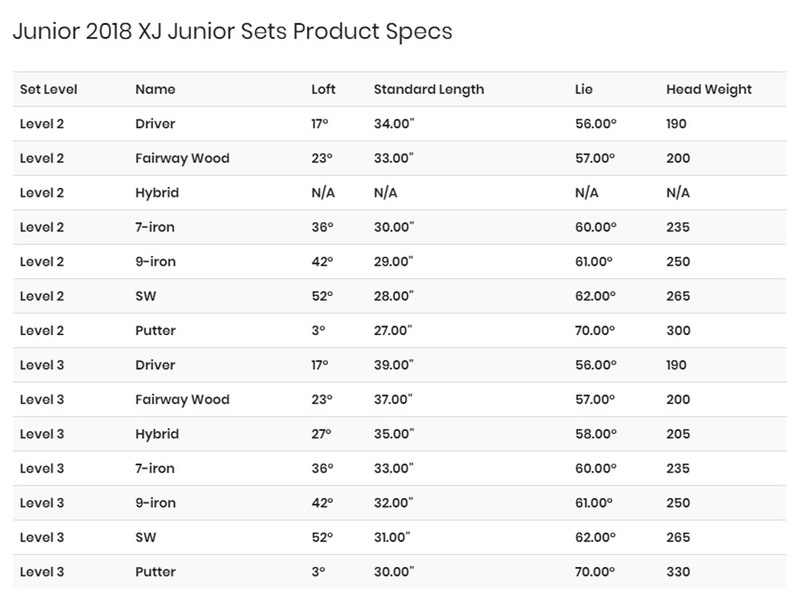 The XJ3 Junior Set is a 7-piece package set featuring the following: Driver, Fairway Wood, Hybrid, 7-iron, 9-iron, Sand Wedge, Putter plus Golf Bag, matching Head Covers and Rain Hood. To view the Callaway XJ2 Junior Set designed for children height 47-53 inches in height click here.